Nvidia has rather cornered the market when it comes to Android gaming with its range of high-spec devices and exclusive software. 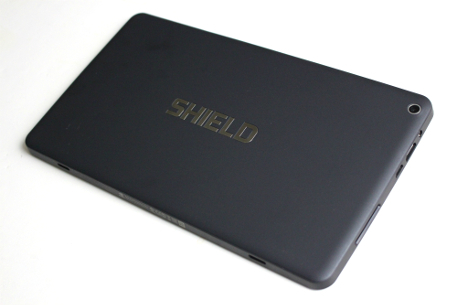 The trend began with the Shield portable, and has continued via the Shield Tablet (2014) and this year's Shield Android TV. We're getting a second Shield product in 2015, but rather than an all-new offering it's a revised version of the aforementioned tablet with some subtle design changes and not much else. The lack of change matters little, however - even after 12 months on the market this is still a seriously powerful slab of tech and comes with a reasonable price point (£150 compared to last year's £240) that will make it popular with Android gamers this Christmas season. 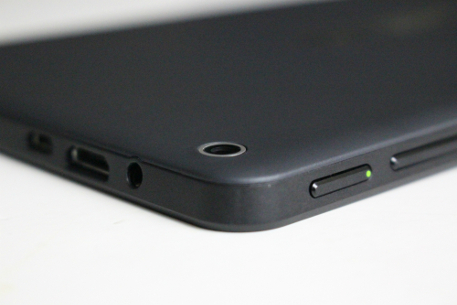 At first glance, the Shield Tablet K1 is virtually indistinguishable to the 2014 model. The screen has the same 1920 x 1200p resolution, and the placement of the stereo speakers and assorted ports is the same. However, there are some changes which become apparent the longer you spend with the device. First up is the removal of the largely superfluous Shield Directstylus which docked inside the casing of the 2014 model - this is now an optional accessory priced at £14.99. There are cosmetic alterations, such as the silver "Shield" logo on the rear and the slightly different texturing on the bezel at each end of the device. Aside from these telltale signs, you could easily mistake this for the original model. The screen might not have changed, but that's not a massive issue as it's bright, sharp and boasts excellent viewing angles. It's not an AMOLED panel so the blacks aren't are black as they could be, but compared to the displays on other tablets of this size, it's an impressive showing. The audio side is equally striking, with the stereo speakers offering punchy, room-filling performance. 16GB of storage is included as standard, but there's a MicroSD card slot so you can easily expand that figure with removable media. There are front-facing and rear-facing cameras, both of which have 5 megapixel sensors and can record HD video. The device ships with Android 5.1.1 Lollipop out of the box, rather than the more recent Marshmallow. That's not too much of an issue as hardly any Android devices - outside of Google's Nexus 5X and 6P - are running the latest iteration, and in the past Nvidia has been impressively quick in getting updates rolled out. This is helped in part by the fact that it uses an almost-stock version of Google's operating system, which means that Nvidia can get updates ready and rolled out quicker than other OEMs, who tinker with the software and add their own user interface skins and bloatware. 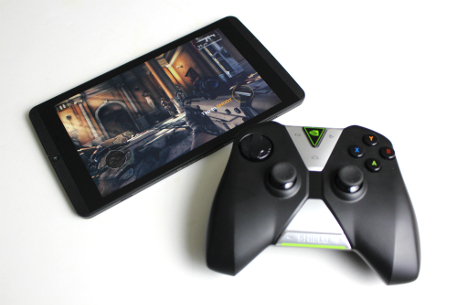 The Shield Tablet K1 is using Nvidia's Tegra K1 "system on a chip", which boasts a 2.2Ghz quad-core A15 CPU and is backed up by 2GB of RAM. It's the same setup which powered last year's edition, and despite the passage of time it's still one of the most impressive mobile chipsets on the market. 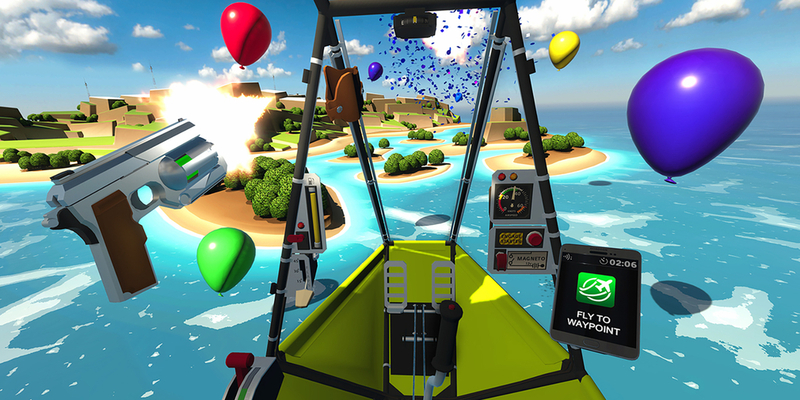 Overall performance is absolutely blistering, with games like Real Racing 3, Horizon Chase, and Modern Combat 5 all playing with silky-smooth frame rates. Nvidia boasts that Tegra K1 is capable of outperforming the likes of the PS3 and Xbox 360, and based on the evidence seen here, that's not a hollow claim. Android gaming has rarely felt this smooth and lag-free, and that's just standard Android games - once you take into account the many Shield-exclusive titles on the market - like Doom 3, Half Life 2 and Portal - the picture becomes even more impressive. 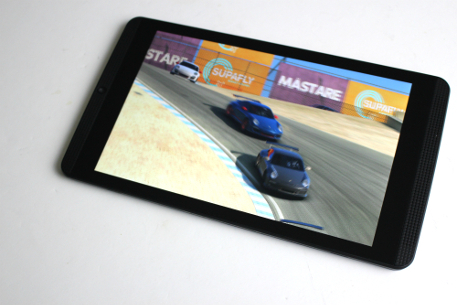 In short, the Shield K1 is one of the most powerful Android tablets on the market, so if you're after a peerless gaming experience from your slate, then this is the best bet in town. You can even hook it up to a TV using a HDMI cable and enjoy big-screen gameplay, but you'll need to make sure you invest in the Shield controller (another £49.99) or purchase a Bluetooth pad. Android purists will love the fact that the Shield K1 comes with a largely vanilla version of Google's OS, so you aren't bogged down with apps you can remove or needless UI modifications. This will also ensure that the tablet gets the latest software before many of its rivals - that has certainly been the case with previous Shield devices. The gaming performance here is second-to-none, and the ability to seamlessly connect the optional Shield pad makes it feel like a proper gaming system - there's no need to dig into the settings to add a controller as Nvidia has baked in the functionality into the OS. 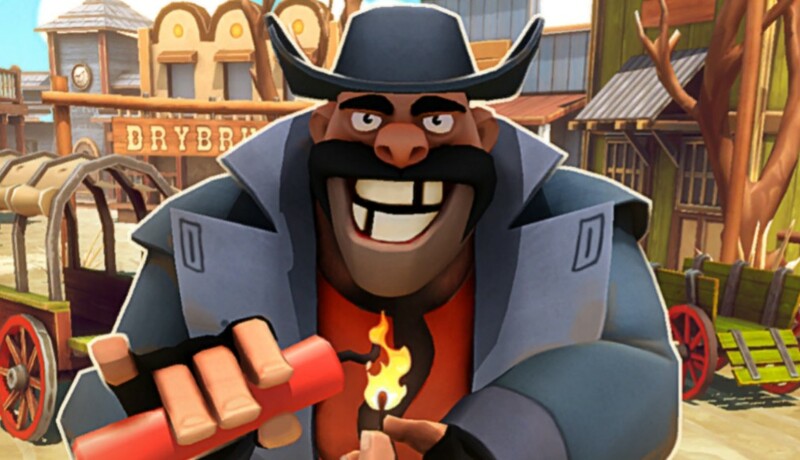 In terms of software, many Android games feature support for physical controls and play better than ever on the Shield K1. There's also an exclusive Shield store which showcases games which can only be played on Tegra-based hardware. In addition to this, you can stream PC games to the tablet (provided you have the correct Nvidia graphics card) and sign up to Nvidia's cloud-based gaming service, named GeForce Now. A three-month trial period is offered, after which the cost is £7.49 a month. 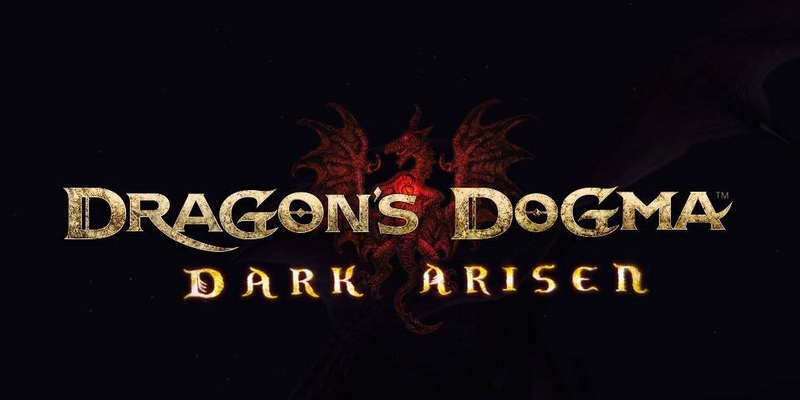 That's not a bad price when you consider you get access to some pretty recent games, but the very latest titles have to be bought outright for quite high prices - you do get a free PC download code with your purchase to soften the blow. 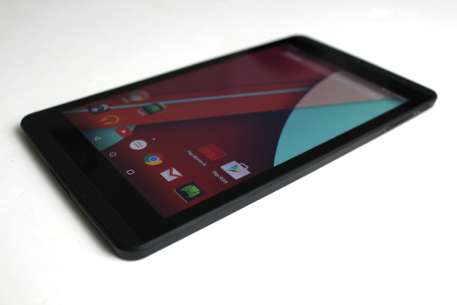 In order to keep the price as low as possible Nvidia has made some sacrifices with the Shield Tablet K1. The box is curiously light on items - you basically get the tablet itself and a small instruction sheet. There's not even a Micro USB cable for charging - it is obviously assumed that you have enough of these laying around the house for this not be an issue. Keeping that in mind, you'll have to buy a few optional accessories to get the complete experience, which drives the price way above the £149.99 the device sells for. A controller is £50, and the near-essential folding screen cover is a further £19.99. Want the official charger? That's an extra £17.99. While the Tablet K1 is undeniably amazing value for money, it's worth keeping in mind that the true price - if you don't own these items already - will hover around or above the £200 mark. The Shield Tablet K1 is basically a slightly stripped-back version of last year's offering, but with a much more appealing retail price. The changes made are so slight that you probably won't even notice - the Shield Directstylus seen on the original was always a niche feature - yet the power on tap is jaw-dropping. If you're serious about Android gaming and want a portable device then this is the best choice by some margin, although it's worth keeping in mind that you may have to shell out for some extra items, such as the official controller, cover and (potentially) a charger. 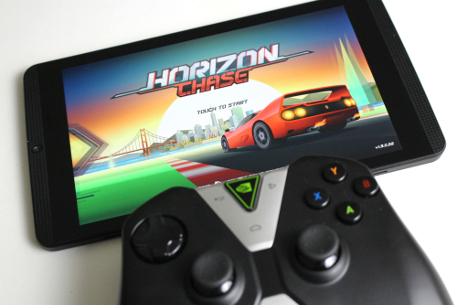 Thanks to Ebuyer for supplying the Nvidia Shield Tablet K1 used in this review.